Sudbury again - but for the first time AT Sudbury! Sudbury are familiar opponents now (and occasional team-mates) but this Sunday see our first visit to Suffolk. The address is of the ground is Moors Field, Rugby Road, Great Cornard, Sudbury, Suffolk CO10 0JR. Maps and directions are here. Journey time is around 70-90 minutes (a bit longer than the first estimate), and the kick-off is due to be 1.45. We are advised not to arrive too early as there may be parking problems due to junior cup fixtures in the morning. So we will be meeting at the club between 11.30/11.45. Its only just over a month before Randy leaves us but she'll have a memorable last appearence in a county shirt on Saturday when she, Katie and Natalie take part in an inter-county sevens tournament which will be taking place as a "curtain raiser" before the England/Scotland Six Nations clash at Old Albanians. They will be playing against Essex, Eastern Counties and Surrey for a place in a final to be played on the main pitch just before the international kicks off. For the past two years we have puzzeled and scratched our heads wondering how on earth east could fail to pick Nim for the U17 squad. Well, the good news coming out of the East have trials is that at long last she has been selected for the squad - the only non-Welwyn player from Hertfordshire selected to far! Unfortunately that was the end of the good news from Ely. Laura has a retrial for prop so fingers crossed there, but for Jess, Emily, Sophie, Katie, Carla and Hayley is was a disappointing outcome. Carla didn't seem to put a foot wrong - throwing like we've never seen her all season. But she and Emily were up against six or seven other props making it a tough call. Jess seemed to have an off day, but she and Sophie were up against 22 other centres and in the end Sophie's relative inexperience and unfamiliarity with the drills cost her, while Katie played a blinder in the match but was also let down in the drills. But its Hayley's non-selection that is the biggest shock. The final touches and bookings are now being completed and having completed your first fundraising event your first batch of sponsorship money is now due in. Can all players please give their first £30 of sponsorship to myself or Mike Alcock in the next week please. The deadline is Sunday game at Sudbury as we wish to place the kit order first thing next week. Little Laura has sent the benchmark with sponsorship moneyas we have allready recieved it in full and it amounts to £110. Well done Laura!!!! Get that money rolling in. Good luck to everyone going to trials at either Ely or Kettering on Sunday. The weather has turned, fortuantely, so it should be no colder than last weekend. We haven't got anyone for the U14s this time - in either East or East Midlands - but Nim, Hayley, Laura, Katie, Sophie B, Emily, and Jess are competing for places in the East U17s (Sasha is alreday in the squad!) while Fern flies the flag for Letchworth at East Midlands. Most of the coaching staff are also involved. John is "running" the day at Ely, where Mike takes up his role as U17 coach, and Joe will be helping to run the adult regional trial - which is being held back at Letchworth. 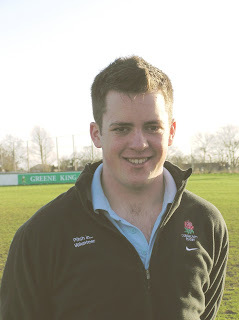 Congratulations to Joe who - much to his embarrasment maybe - has been awarded the RFU's "Young Volunteer" Award for his work with the girls' team. Instead of a plaque or cup for the mantlepiece or cabinet what he actually wins is an "exclusive" Nike fleece, which he can be seen proudly modelling here. The scheme - which was launched last year but without much publicity for some reason - allows the RFU to acknowledge and reward "outstanding young people who have not only made a significant contribution to their rugby community, but have also embarked on a pathway of personal development through their volunteering experience". The award open to anyone aged 16-24 so it is quite possible that Joe will not be the only person connected with the girls' section to be wearing one of these tops. Indeed if any of you can think of anyone else deserving of similar recognition you can nominate them via an application form on the RFU website. Meanwhile Joe had better get used to this sort of thing as this as I suspect that this will not be the only award he will ever win. Well done U14s, sorry U17s! A bit of a mixed day today. The U14s had an excellent afternoon. First they did brilliantly warming up while we waited for their teamates to arrive from all parts of the compass. I was impressed by the really professional and mature way in which they got themselves organised while I chased around getting what was a very complex day going. It was also great to see how well everyone got on. The eventual "Letchworth" team included girls from five different clubs (Letchworth, Ely, Wymondham, Market Harborough, and Kettering) thrown together - in some cases - barely five minutes before the start. But you would never have thought this from the way everyone played and worked together. You actually made a really good team and it would have been impossible for anyone watching to be able to say who was from which club. As for the game itself, dodgy referee aside, it was a pretty physical - but quite exciting - match. Thomas Becket perhaps betrayed a lack of match practice - certainly discipline at penalties and set-pieces in general cost them badly - but there was only one score in it for most of the game - in fact if they had not missed a conversion at half-time we'd have gone in at 21-all. Having the slope helped in the second half, but even despite that with six minutes left there was only seven points between the sides before a final try (again Becket caught napping at a penalty) resulted in a 38-26 win for the "home" side - one highlight being Hayley kicking five conversions from seven despite the strong wind! The U17s did not have as successful a day, mainly because we could only get six girls from two clubs as "opposition" which was not enough for a game, but too many to be able to run any meaningful training either. Should we have maybe cancelled when Kettering and then Peterborough pulled out? Well, maybe - but then that might have affected the U14s as Market Harborough would maybe not have come at all, perhaps. Also by giving girls from smaller, newer, clubs like Harborough and Ely any sort of game we at least keep them going - keep them interested. Only two years ago we had barely six or seven U17s (in fact we started that first season with precisely one!) and - if the rules had been as strictly applied then as they are now - we too would have been taking a handful of girls to away games. In a couple of years time Ely and Harborough could have developed bigger, stronger teams able to provide us (and others) with good, competitive games. By giving the sort of support that you did this afternoon you keep their enthusiams going and help them reach the same levels we have. After all, if Kettering or Peterborough (or Hertford or one or two others I contacted) had only been able to send us four of five more girls between them we could easily have had an afternoon as successful as the U14s had. They couldn't in the end, but that happens sometimes. Finally the scout tag did not, unfortunately, give us any possible new girls - in fact there was only one girl scout present and I know she is pretty committed to other sports. Other than that disappointment it actually worked quite well as an idea. Are any of you in the Guides - do you think they'd be interested in anything similar? The "Start Rugby" evening coaching course will now be on the evening of Monday 19th March. This is a bit later than first expected, but on the plus side that also means it should be a bit lighter in the evening. Actual times not set yet, but I'd guess something like 6.30 to 9.30. This course really is aimed at parents as well - anyone who wants to go slightly beyond just standing on the touchline and would like to help out a bit more. All feedback on previous courses has been very favourable - and there is plenty of time to add names to the existing nine from the girls section. Let me or Dave Roberts know if you are interested. Tomorrow - update (slightly better news for U17s)! For the U14s Thomas Becket are bringing about 12. To play against them we will have our girls, plus about three from Market Harborough, one or two from Ely, and one from Wymondham. A BIT of a mixture, but it will be a game! For the U17s I was hoping that Peterborough would be able to send some girls who could combine with Market Harborough - but now they are not coming. However Ely are now also sendin three - so with the three girls from Leicestershire we're close to at least a 7-a-side game or two, probably following some training which will include the visitors. And you also have your run. Arrival times - U14s from 12.30, U17s from (I think Joe said) 11.30? The boys have cup games in the morning so parking may be a problem at the start and we'll have to wait until they finish before we get the pitches and changing rooms..
Fern wins place on three-day rugby "camp"
It pays to enter these competitions you sometimes see - as Fern has just discovered. Fern was called aside at school today ("oh heck what have I done now...") to be told that she won one of only three free places at the "Rugby Evolution camp" to be held at Bedford Athletic RFC over the February half term where she will be coached by US Eagles coach Brett Taylor and Paul Grayson from Northampton Saints. She will also get to work with several players from Northampton Saints - so it sounds a bit like the Saracens training camps some of the you have been to in the past (though at £75 for three days its quite competitively priced). RFUW aim stamp out National Cup "ringers"
I am dropping you an email to clarify the use of players in the Cup Competition, as currently there are various rumours circulating about clubs hoping to recruit players from Regional Trials for their Cup Matches. Firstly a player can only play for one club in any competition, so even if a player transfers to your club they are cup tied and cannot play. At the start of the cup we did allow clubs to cluster and join forces so the girls got to play rugby, i have a full list of which clubs have joined forces to fulfil their fixtures. wish to bring in any player from outside your club then either myself or Kean need to be consulted on the reasons why and we will decide if that player can be added to your squad. Any number of fixture changes in the last few days - if you thought you knew who we are playing and when over the next few weeks then you are probably wrong! All amendments are now on the list. The National Cup semi finals for both U14s and U17s have now been postponed until 25th March. Regretably (but maybe not surprisingly) the idea of dragging teams from Somerset all the way to Hertfordshire did not win much support! This means that our little "festival" - at home to Saracens, Ampthill and Milton Keynes - will now not take place, at least not on that date. Instead we'll be off to... who knows where - but maybe not Dorset (or at least not Wimbourne) as RFUW are looking for a neutral venue. It will also mean at least one change to Joe's squad as unfortunately Randy now will be unable to play. It also means we probably revert to Plan A for 4th February - a visit to Sudbury! If the weather were not enough of a problem, the forthcoming weekend is ina state of flux at the minute. On the plus side we WILL have plenty to do for the U14s. Potentially hordes of them from Thomas Becket, Oundle/Kettering, and Market Harborough will be coming plus maybe some from Eastern Counties. Obviously this means that we really could do with as many as possible of our own girls being available! For the U17s its less good as Kettering lost several players at their game last weekend (clearly North Kesteven take no prisoners) and will not be sending a team. And Market Harborough only have four U17s. It is possible that Kettering may send a few walking wounded, and Hertford have been asked if they could send any of their girls (those who are not training at Welwyn for the cup), and again Eastern might have a few so we might be able to get an opposition of sorts. Failing that we train! In addition there is the cub/scout tag tournament. Fingers crossed that there will be a good selection of girl scouts turning up as we might be able to recruit some. If the U17s have no game a bit of promotional activity here would be a really good idea. Kettering and Thomas Becket will also be bringing tag teams, incidentally. Below are the names of the 25 players we would like to take to the National Cup Semi Finals on the 4th Feb. The following are asked to be on standby in case of injury. If you are listed above and can't play on the 4th Feb or have any other problems please email me at daddyrandall@hotmail.co.uk. Thankyou to all that played yesterday, it was a brilliant day of rugby. A big thankyou to all that participated yesterday from both clubs. It hand't dawned on me exactly how difficult selecting the squad was going to be. My apologies for the delay in naming the squad but am waiting for confirmation on player names. As soon as I get this information the Squad will be named here. Phil's camera has picked up all the highlights of Sunday's rugby at Saracens, including the U14s who this week had something worth travelling for! And - with the help of some Eastern girls - a win as well! Click here to catch the action. An enjoyable afternoon for everyone - a comfortable win for the U17s over Saracens, and a narrow defeat against Sudbury in yet another incredibly close game between our two clubs. Perhaps in the end the difference was that we were missing one or two key attacking players, but overall our defence was superb all day. If we can get the best of both clubs working together on 4th February then we could well surprise a few of our opponents. So as I promised on Wed, here is the link to Anna's web page. It is nice bright and funky and has pictures of some of your games. Plus shortly the ones taken on wed! Keep a eye on it for updates and pics and notices from ME!! Nothing confirmed one way or another about possible pre-international displays this season (and therefore free tickets) - though the weather might put an end to that anyway (at least for the first game) as the authorities are likely to not want their beautiful turf ploughed up by hordes of juniors just before the international! The games at OAs are on 3rd February (day before the National Cup) v Scotland (KO 2.30) and 11th March (day before a regional training session) v France and France A (KO 1.45 and 12.00 respectively). Tickets £7.50 (adults) and £2.50 (U16s) - not bad especially for the France game. The third game at Twickenham on 10th February will be FREE entry - but after the men's international has finished (so from around 4.00). However, if you take travel and car parking into account there's probably not that much difference. Still we could potentially try to arrange trips to all three. Personally I reckon the French game will be the most interesting. U14s: "Herts Barbarians" (ie. us, Saracens and Eastern Cos) opponents will be Cranberleigh (Surrey/Hants), Ellingham and Ringwood (Hampshire), and Thornbury (Somerset). Finding information about U14 teams is hard work but Cranberleigh we know about, Thornbury reached the National Cup final at U17 level last year, and Ellingham had a habit of winning lots of Plate competitions in 2005/6 but no-one has bothered to update their website for 2006/7. Just to add for the U14s that there will also definately be opponents for you for the home game on the 21st. Market Harborough are bringing some U14s, and now Thomas Becket School will also be bringing a full side, plus we may get some girls coming up from OAs. And we may be able to get some of the scouts who are playing tag to have a go..! Assuming flippers and snorkels are not required this time the kick-off is due to be 1pm. So meet at 11.15 for a departure of 11.30, to arrive c12.15. The fixture includes both Saracens and Sudbury and for both age groups this will - at least partially - be a trial day for the cup semi finals. So the U14s are guaranteed a fixture!!!!! For the U17s it is Joe's intention is to select the cup squad after the games. Simon - the Saracens coach - is reponsible for the U14 squad. Regular cold weather training reduces likelihood of illness Research from Japan shows that if you train regularly during cold weather periods you are less likely to pick up illnesses, such as colds and flu, than if you train on the odd occasion. This means a gradual introduction to the cold weather is better than huge one-off sessions. The cold reduces the desire to take on water, causing further dehydration. Therefore it would be good to take on water before training, and then hot drinks afterwards. This used to be the case in the old days after a game, when a hot cup of tea with plenty of sugar was a staple for the muddied oafs in the changing room. mortals though, run on hard surfaces in dry trainers. Choosing the right clothes to train in can be difficult, use hoodies and tops with zippers, because there needs to be a balance between warmth, sweating and movement. Hoodies are excellent because they can be used at the start of the practice to keep the head warm and then the hood brought down when the players heat up. If there is a break in play, then the hoods can go up. Do not wear them during contact where they could be grabbed, or stuff the hoods inside the neck. Tops with zippers allow you to regulate heat – too hot so undo half the zipper on the jacket to let warm air out from bottom of the jacket. Wet clothes lose their insulation properties quite significantly. If at all possible avoid contact with the ground with clothing in the early stages of the session. Cheap rugby shirts can be better rather than cotton/ woollen – more effective at staying dry and even when wet, keeps you warmer than cotton shirts. On 21st January, when Kettering and Market Harbourogh visit, there is also going to be a cub and scout tag tournament at Letchworth. If you know any cubs or scouts, especially girls, encourage them to take part. If you are a scout yourself, offer to teach them a few skills. Almost all scouts will be U14s so any girls will be prime targets to recruit into our U14 team - and as scouts are physical, outdoorsy people who don't mind a bit of mud given the chance to sample the game there is a great chance that they will take to it. If it goes well we might look to maybe run something for Guides - do we have any Guides in the teams already? First we must apologise to our U14s who made the long trip up to Kettering for no game. There is really no excuse for this whatever our hosts may have said - the rugby master from Thomas Becket in Northampton was there, for example, and said he could have brought a U14 team with him if he had known. There were all sorts of alternatives we could have tried if we had known just a day before - as it was we did not know anything until we arrived. It doesn't help much to say that this was the first time it has happened quite like this. I know you are not having the greatest season - U14 player numbers at many clubs are a problem, not just Letchworth. However we know you will be okay next week at Saracens and we'll be working hard to make sure you have some opponents for the 21st. As for the U17s - as Joe said you played better than we've seen you for some time, but still lost in a tough game between two sides that were pretty well matched. In fact we were probably ahead of bit in the scrum, maybe less so in the rucks ... but some interesting decisions pushed the balance the wrong way perhaps - though in the end Kettering were the better team on the day, 27-0 exagerates the difference a bit. However I must say that the great thing was your reaction at the end. You all knew you'd played your hardest and you had enjoyed the game, regardless of the actual result. Sport is about more than just winning but some clubs heads would have been on the floor and who would have been straight in their cars and off home (indeed we've seen it happen). You showed great maturity and sportsmanship - well done! And you can put things right in two weeks time! Meanwhile pictures from the day are already up on the Threfall Archive. Women's rugby: a history back to... when??? Probably Joe's fault this, because I'm not entirely sure why I should start thinking about looking back on past women's rugby internationals, but the discussion about the "team outing" to the Six Nations games at OAs perhaps was one reason. Except that - while the men's database does indeed include ever international ever from the year dot, with every fixture included from England vs Scotland to Japan vs Korea - the women's database isn't quite as extensive. Indeed it may be news to everyone to learn that - according to the IRB - women's international rugby began rather more recently than 1871. Indeed FAR more recently. In fact the first game they acknowledge was on 4th February last year - that cold night some of your will remember when England beat Wales at OAs. Yes indeedy, our international governing body seems to think that THAT was the first ever women's international. Pathetic isn't it? Also I guess mildly predictable. I suppose the only positive argument might be that perhaps only men are sufficiently mad enough to want to look up the result of Wales v Scotland from 1925, and there may be something in that, but even so personally I suspect its more an indication of how seriously rugby's Lords and Masters take the women's game. Ah well, at least the IRB acknowledges the 2006 internationals (well, most of them). Presumably 12 months ago it didn't even do that. So we are getting somewhere. Slowly. Maybe. Download RFUW's registration form and send it off as soon as you can. If you already have then great - there will be a delay before Region gets them from RFUW so no need to worry - but if you haven't get on with it! You have until the 19th January to get your form to Twickenham. Details of forms received by the region to date will appear as they arrive on the East website.